May have a change of plans announcement soon (those with RSS feeds probably already know what). Recently, on my Twitter/Facebook status (the two are synced), I stated, "Nominates the elevator near the Lily greenhouses for 'Creepiest Elevator in the World.'" This status got a few comments along the lines of "it is," "it is not that bad," and other anecdotes. Due to this, I have decided that I should hold a Creepiest Elevator Contest right here on this blog. The problem is - I need to develop some rules. So, ideas? So far one of my former classmates has commented that stairwells should be included or at least given honorable mention. This lead me to wonder about something such as a dumbwaiter. What do people think? Should I require pictures? Anecdotes? Quotes from others? Should this be open to stairwells and dumbwaiters (and if so where does this end?)? How should it be judged (me, poll, guidelines?)? Should this elevator have been seen in real life? etc? So, please, blast me with ideas, information, and the likes. You can comment on this blog, my Facebook status, or email me ( Genesjockey (at) GMail (dot) Com ). I will then try to compile a list of rules. Also, please tell me if I can release your name with the idea/rule. One fun online tool I have found and just wanted to note is Wordle. 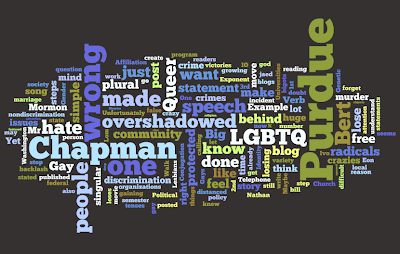 Here is a wordle of my blog, the bigger the word the more common it is on the blog. Hope you like it! It is pretty fun, play around with it. Nathan and I have now been dating for a year! We celebrated by watching lots of movies and playing Digimon (Pokemon HeartGold and SoulSilver don't come out for a few more months, or else we would probably be playing that, lol). Break was long (I am in favor of really short breaks but every weekend is 3 days, who is with me? ), but we were finally back together, and ready to start new classes. ANTH 204 (Intro to Human Evolution) - Yay social sciences! I am looking forward to this class, mainly because it deals with Evolution. BTNY 390 (Microbiology Lab) - Botany changed its Microbiology requirement to a class I already took (BTNY 207), and added a lab component. In order to dodge the biology version of microbiology, I can take the micro lab by itself. The professor is hilarious, and I am quite looking forward to it. CHM 256 (Organic Chemistry) - I continue on with the second part of Organic Chemistry. Joy joy (I take quite a bit of Chemistry for my Botany degree)! Lecture last semester wasn't too bad, and the professor is excellent, so I think this should be good, probably about the same as last semester. CHM 25601 (Organic Chemistry Lab) - While I did well... Let's just say I only got one perfect pre-lab. I am not exactly looking forward to this lab to be perfectly honest, but I will get through it, hopefully without exposure to too many carcinogens. CS 180 (Programming I) - CS 177 went well, though CS 180 is suppose to be quite a step up. I don't like CS exams though. I can code fine enough, but the exams are brutal (odd errors pop up in the questions). This class will be Java so that should be good. STAT 503 (Statistics for Biological Methods) - The biology-focused version of statistics. I have no idea what to expect. Wish me luck! Queer Student Union - This will be my second semester as Vice President of the Queer Student Union. Hoping this year goes well (maybe some movement on Gender Identity and Expression. HELLO PURDUE, we are a little behind our peers!). GAYpril should be a lot of fun. I am planning to do another talk on Asexuality. (Still thinking about names. Last year it was "Asexuality: The Missing Orientation"). Research - I am working in the lab of Dr Nancy Emery. We will see what all I have to do, but it looks like I will be in there several hours a week. FEELS - I am in a National Science Foundation fellowship program in the College of Agriculture. For it I have to do a variety of things, and we will see what has to be done this semester. Leadership Development Certificate Program - A program I am in because of FEELS, my last Personal Development Plan was rejected due to format (I did not follow the suggested format, and instead used flowcharts), we will see if I can get a new one to pass!